South Dakota is a state located in the Midwestern region of the United States. It is named after the Lakota and Dakota Sioux American Indian tribes. South Dakota is the 17th most extensive, but the 5th least populous and the 5th least densely populated of the 50 United States. 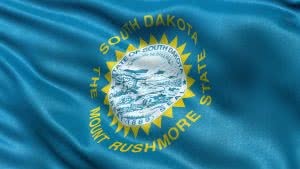 Once the southern portion of the Dakota Territory, South Dakota became a state on November 2, 1889. Pierre is the state capital and Sioux Falls, with a population of nearly 160,000, is South Dakota’s largest city. South Dakota’s major industries include retail, finance, and health care. Name of South Dakota corporation may not be the same as or descriptively similar to the name of any business entities registered or reserved with the Secretary of State. Company Express will research your company name to make sure it meets South Dakota’s standards. Turnaround time: About 7-10 business days. 2-3 days expedited filings are available for an additional fee. Time to file: South Dakota requires corporations to file an annual report in the anniversary month of the company’s incorporation. The state filing fee is $50. Name of South Dakota Limited Liability Company may not be the same as or descriptively similar to the name of any other reserved or registered business entity name. Company Express will research your company name to make sure it meets South Dakota’s standards. LLC’s principal office has to be located inside the state. Local registered agent also required is South Dakota. Time to file: South Dakota requires LLCs to file an annual report before the first day of the second month following the anniversary month. The state filing fee is $50.